Santini is a founding member and the U.S. and China Representative of, a consortium of independent export packing and transportation companies with bases in Europe, Asia, North and South America. Member Nations Include: Austria, Belgium, Brazil, Canada, Finland, France, Germany, India, Italy, Netherlands, Spain, Sweden, Switzerland and the United Kingdom. Each member knows the others well and all have considerable experience of working together on consolidating, preserving, protecting, export packing and shipping from single pieces up to major Multi-National projects. All members are major export pacing and crating companies within their country and are well skilled in working to international specifications. Members meet annually to exchange information and ideas and talking to one Logo member automatically means you talk to them all. 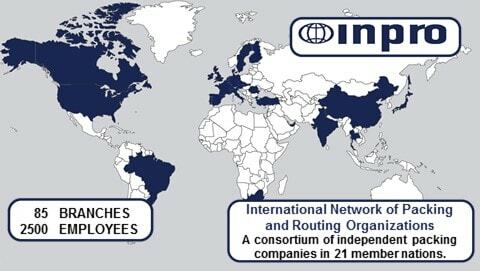 INPRO offers a single undivided responsibility. One central control, one language and one currency. All work is completed to the same high specifications with, if required, a single administrative and invoicing system.